Rock Climbing in the Bay Area and East Bay is Awesome!! 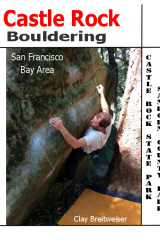 Bay Area Climbers offers helpful information on local routes, beta for local outdoor climbing routes, climbing beta tips, climbing guides, rock climbing topo's for the bay area and the east bay. Featuring route slideshows of Sanborn Skyline, Castle Rock State Park, Castle Rock Falls, Goat Rock, Underworld, West Side Area, Indian Rock, Lime Disease Rock, Summit Rock, Aquarian Valley, Mt. Diablo, Boy Scout Rocks, Pine Canyon and Climbing Caifornia. We also provide book reviews, indoor climbing gym directory, climbing glossary, climbing links & resources, and a quarterly rock climbing newsletter with rock climbing restricted area information and safety tips. Be sure to check out our feature authors, Robert Behrens, Andrew Pizano, Bruce Morris, Chris McNamara, Jonathan Pizano and The Gear Guy. Be sure to visit our sponsor for guided rock climbing classes in the Bay Area! Bay Area Rock Climbers News!! Closure of Summit Rock - due to nesting! Banner advertisement space is available for a low cost! If you have web related issues, want to exchange links, or start advertising with us, please contact Joan. Do you have news for the rock climbers in the Bay Area, East Bay and beyond. Contact us and we'll post the info here!